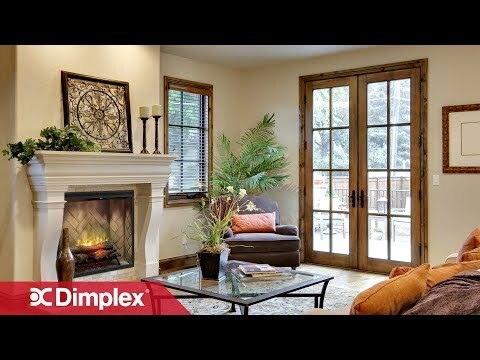 The Dimplex self-trimming electric firebox is a terrific alternative to wood or gas fireplaces, without the hassle. Installation is easy, and in no time you will be enjoying a warm, ambient fire in your home. This electric firebox from Dimplex features smooth edges that allow for flush mounting or installation into a wall, and only needs a 120V household power supply. Patented 3D fire technology gives the fire depth and dancing flames. Hand-finished, LED inner-glow logs are molded from real wood logs and sit on top of pulsating embers for a realistic fire. The flames can be used with or without heat, so the look of a wood fire can be enjoyed year-round. When the thermostat controlled, fan-forced 780 watt/2660 BTU heater is used, the unit can heat a room up to 400 square feet. Once the temperature is set, the thermostat maintains the heat in the room. With 90 percent less carbon dioxide emissions than average gas fireplaces and no harmful particles, electric fireplaces are the safe choice for your home. This Dimplex DF3033ST firebox includes a manual on/off switch and a multi-function remote which allows you to adjust heat and flames from your chair. The electric firebox is warranted to be free from defects for a period of five (5) years from the date of purchase. 400 Sq. Ft. 400/800 Sq. Ft. 1,000 Sq. Ft. 400 Sq. Ft.